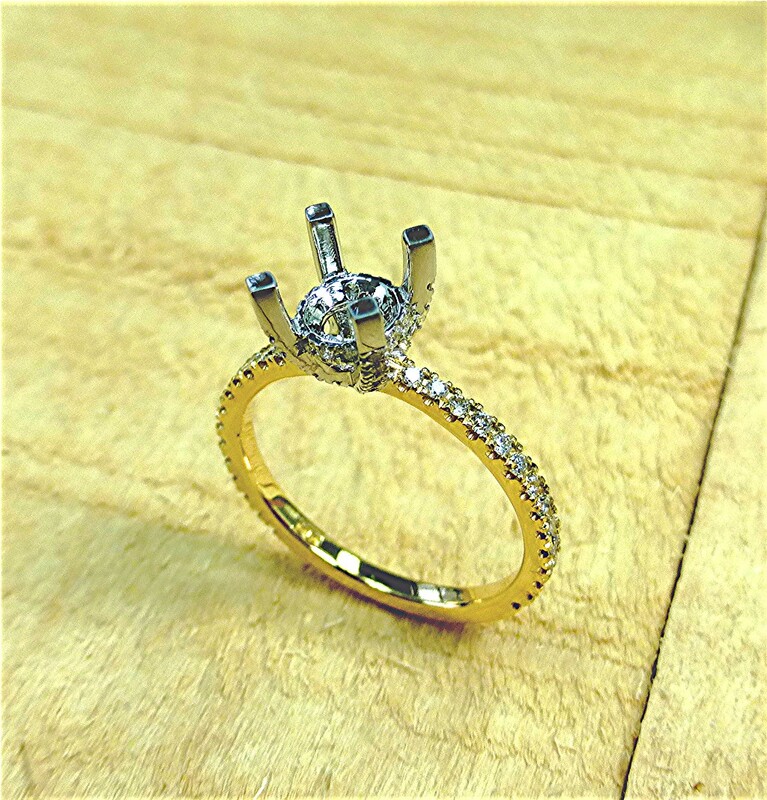 18 round brilliant cut diamonds are micro U set on halo and two diamonds are bezel set under the center (total 0.37ct). 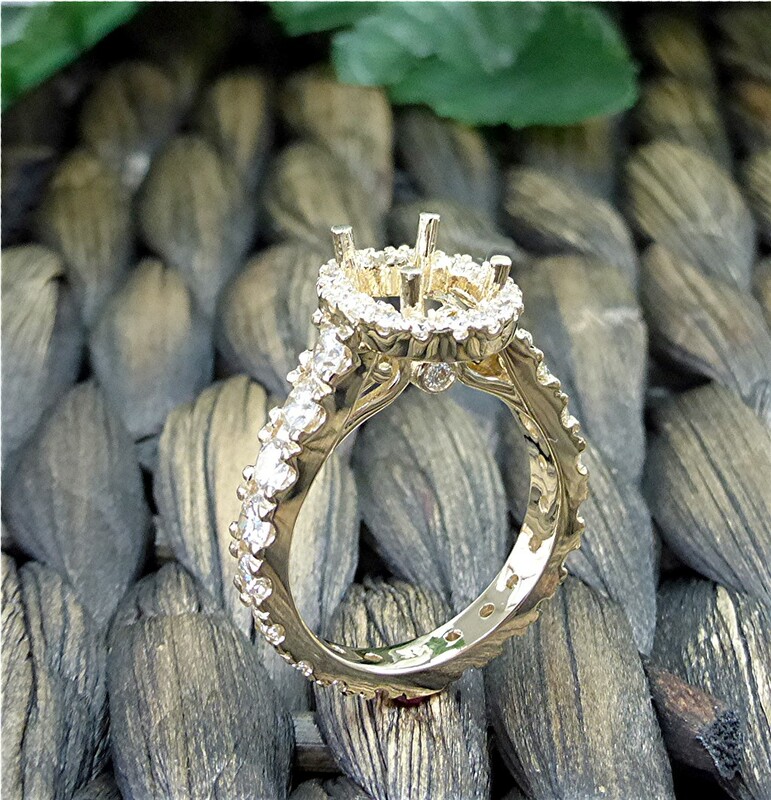 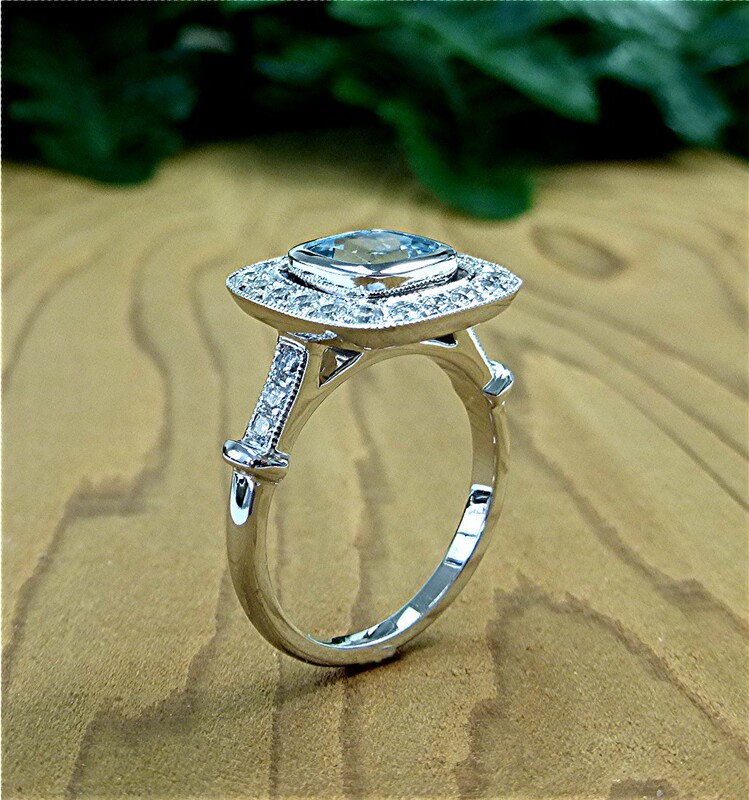 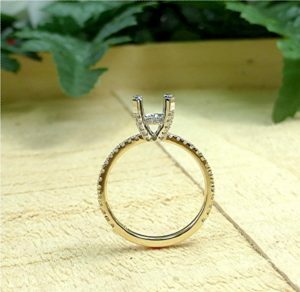 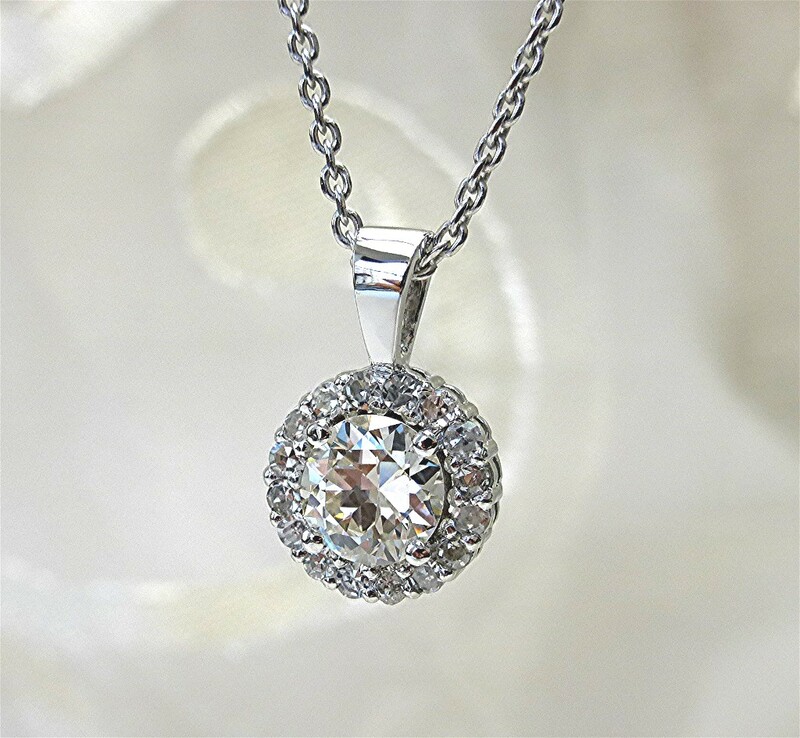 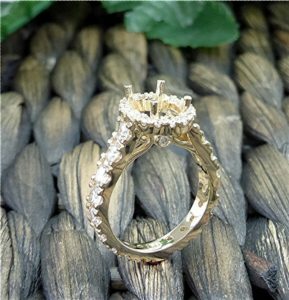 center halo is made for oval diamond measuring 6.54×9.25×3.88mm). 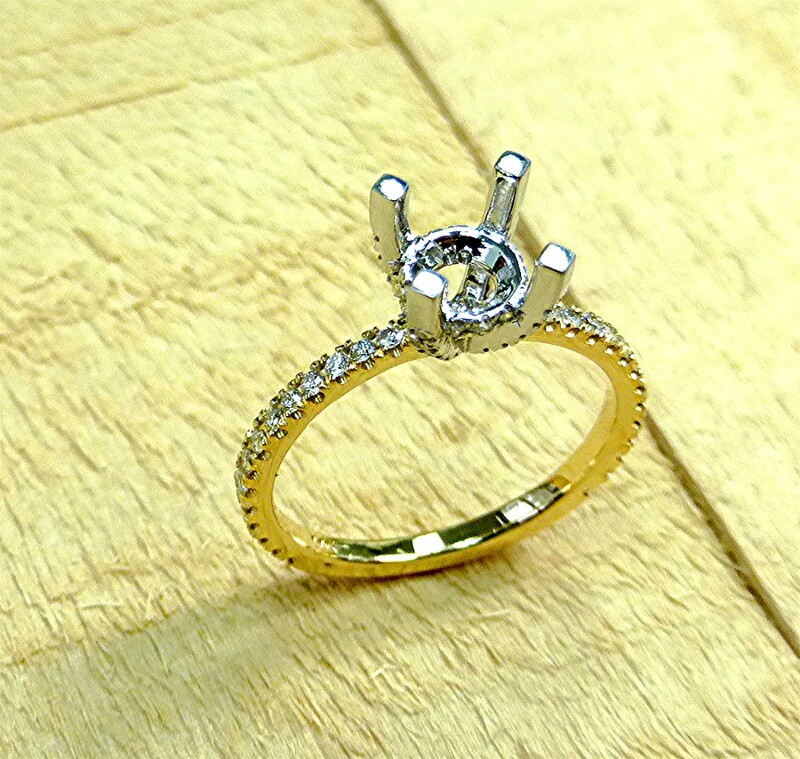 On top of the shank 18 more graduated diamond are set. 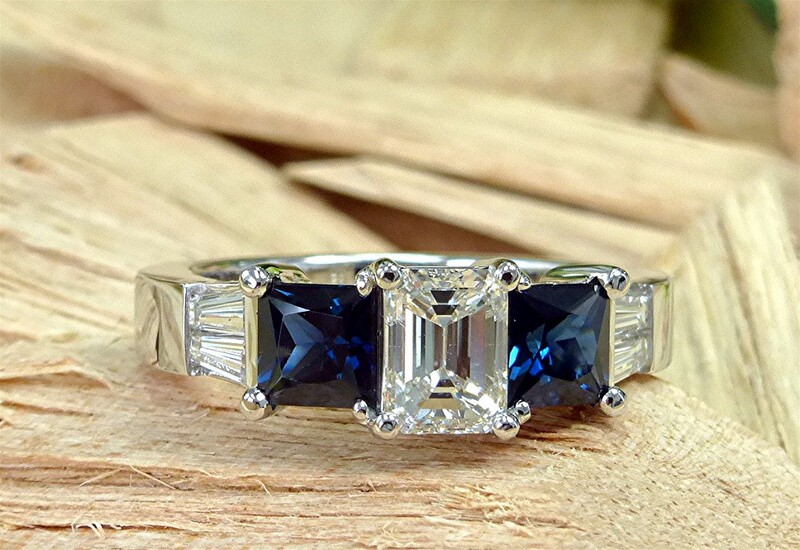 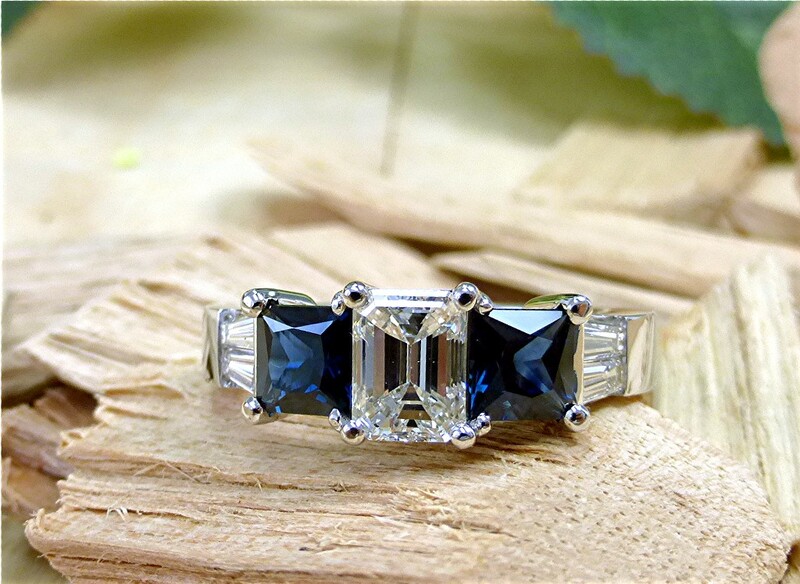 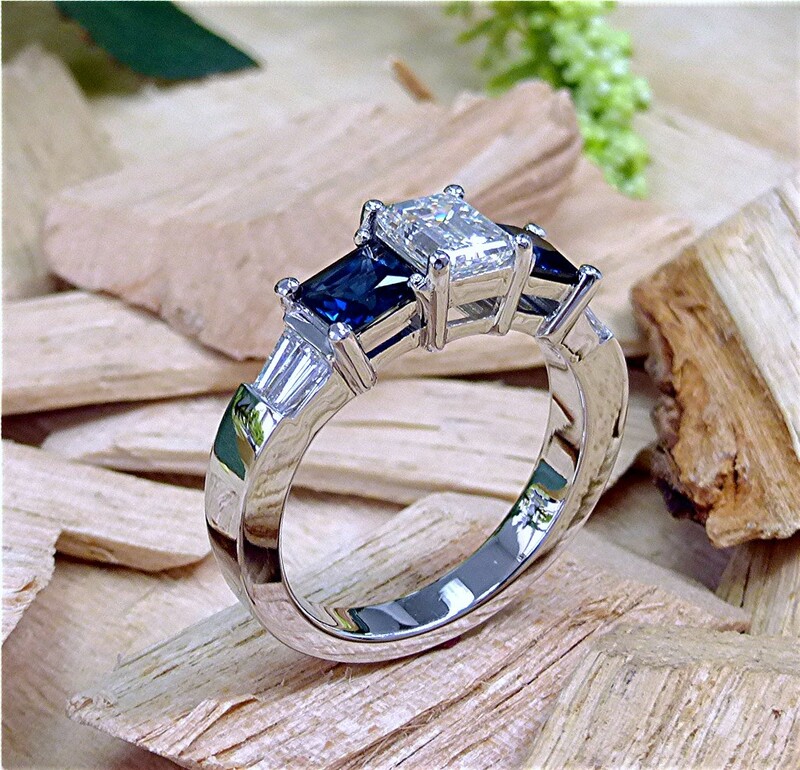 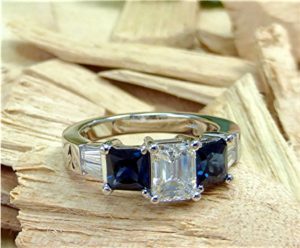 Center is 1.36 carat emerald cut diamond and four tapered baguettes (3.7×2.1×1.6mm) on the shoulders, plus two 5x5mm princess cut sapphires are mounted in 14k white gold. Halo has 16 single cut diamonds measuring 0.40ct. center stone is 6.5mm round brilliant cut 0.94ct. 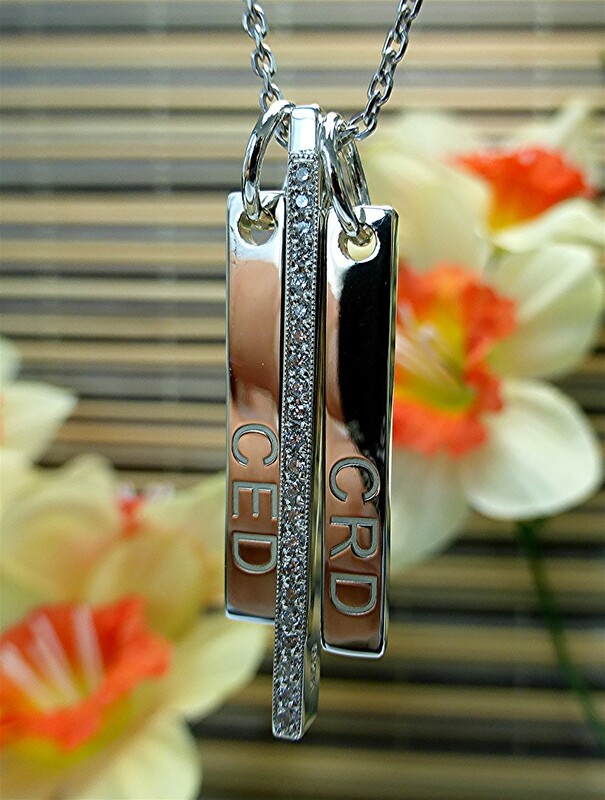 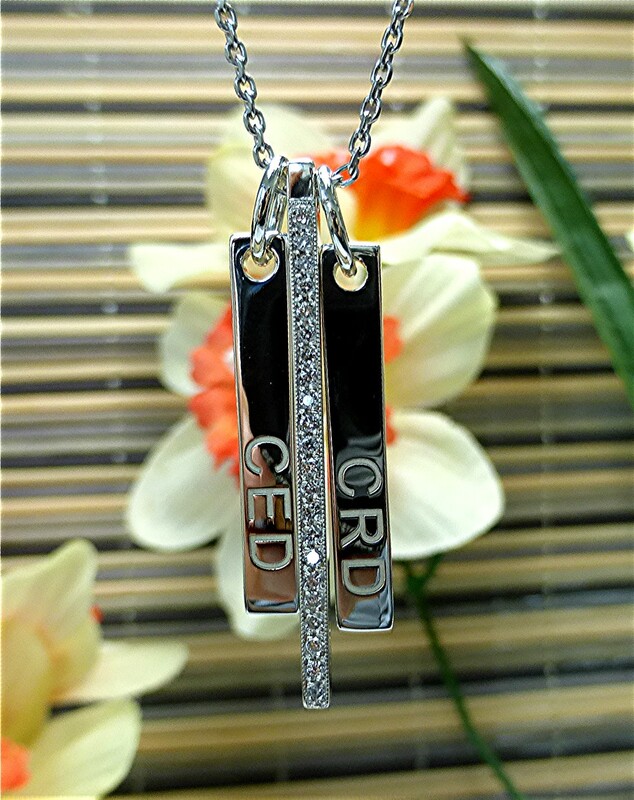 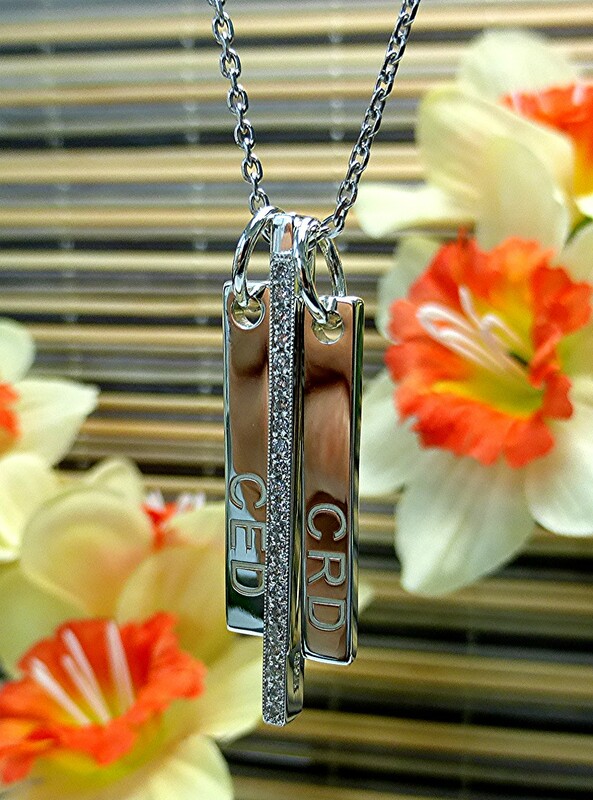 mounted in 14k white gold. 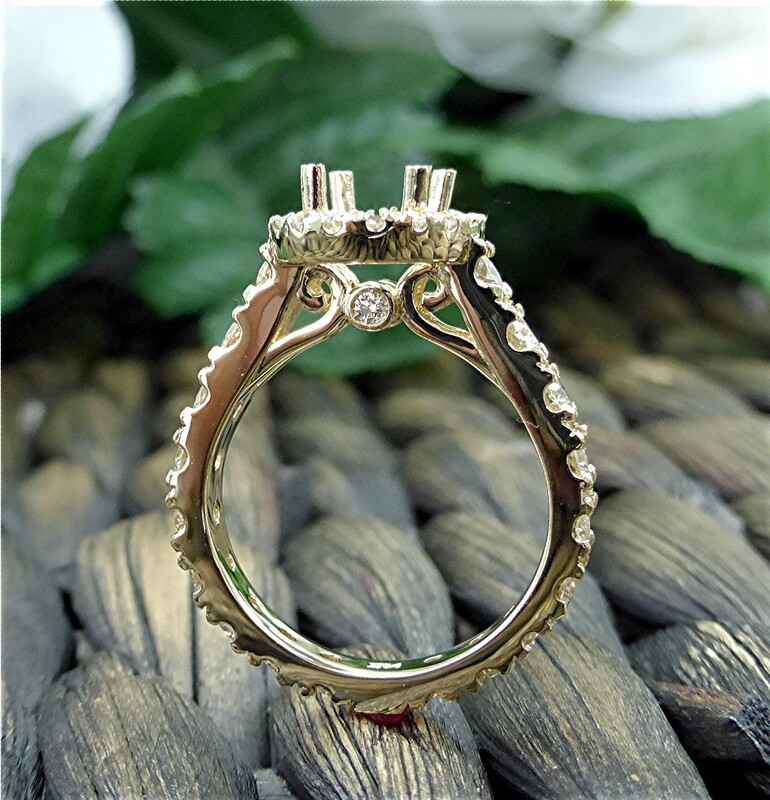 Four prong basket head is made for 6mm center diamond. 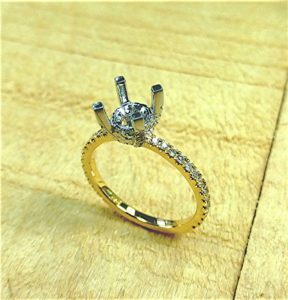 28 RBC diamonds G,SI1 micro U set on the shoulders of the shank and 32 more smaller diamonds are set all over the center basket. 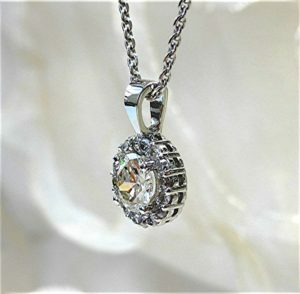 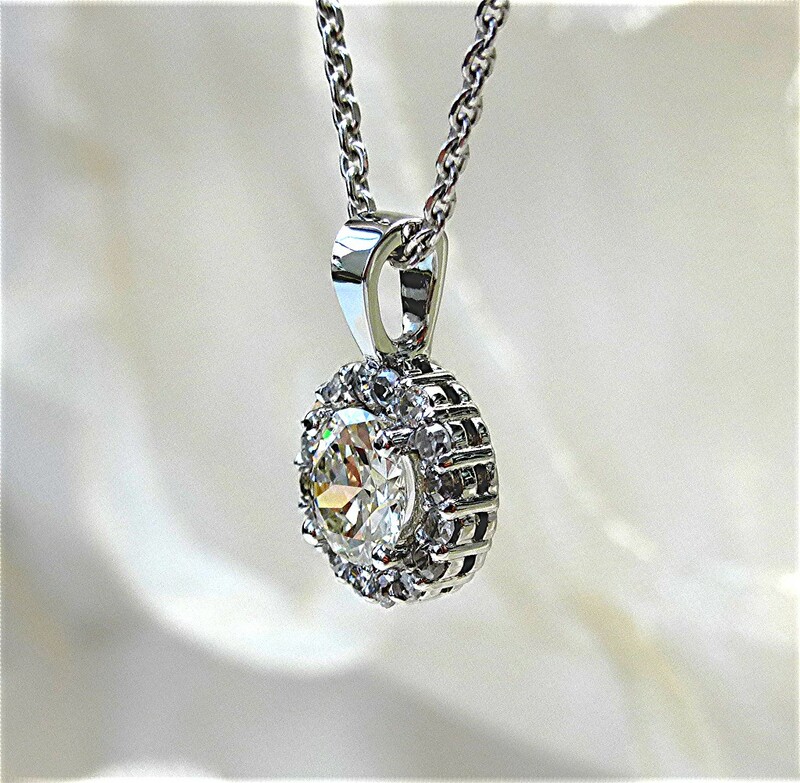 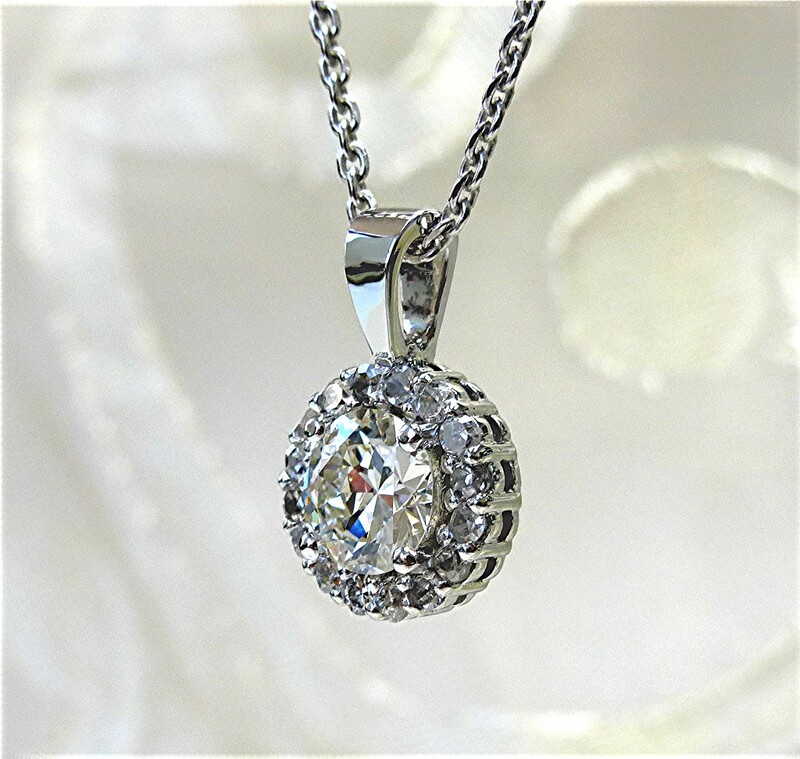 Total diamond weight is 0.33ct. 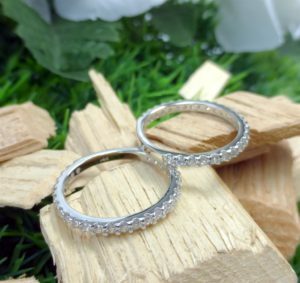 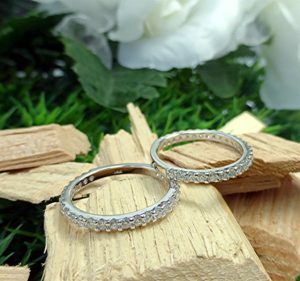 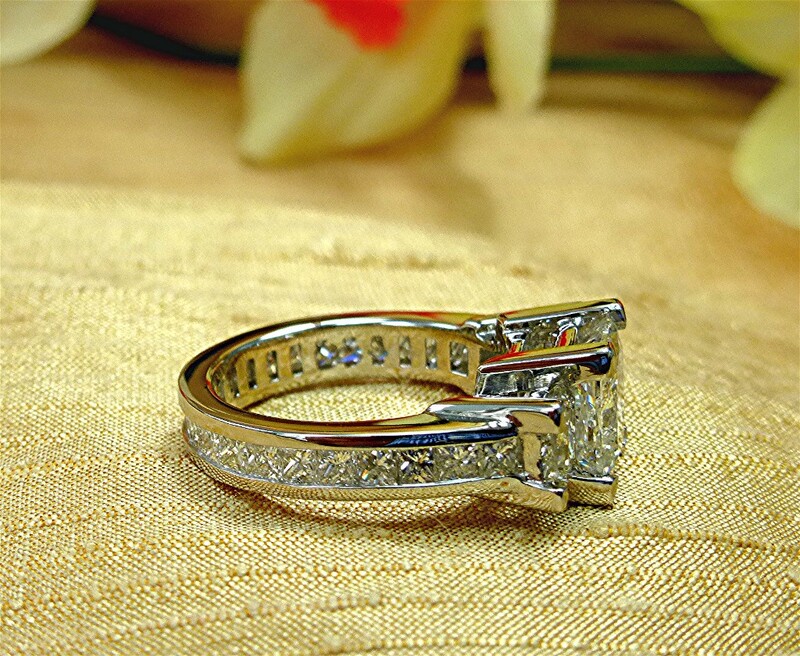 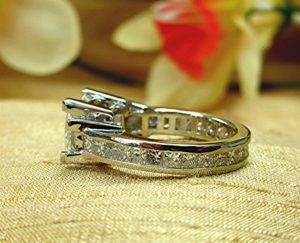 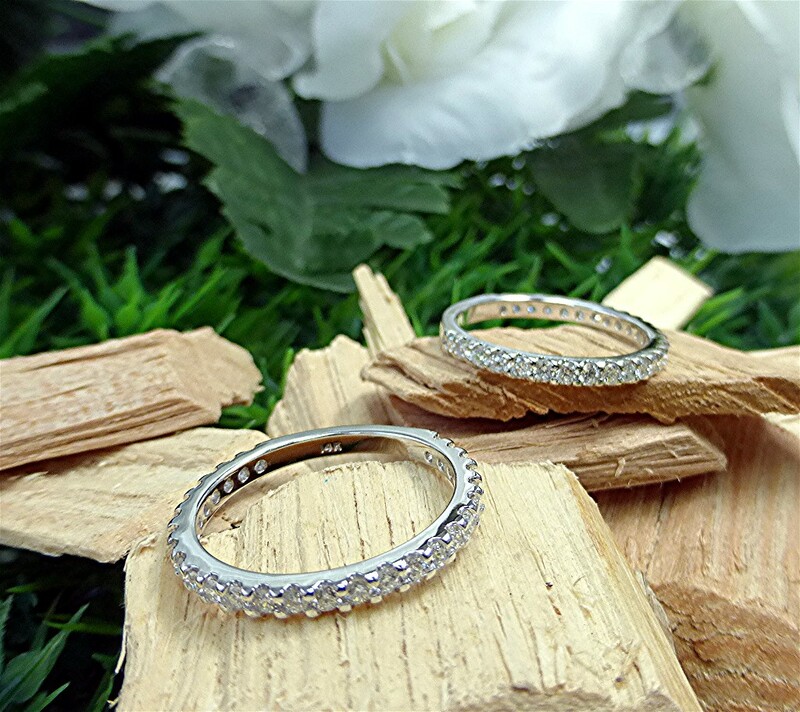 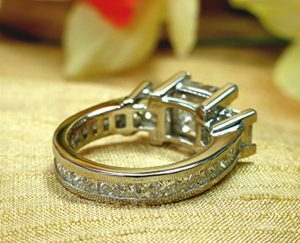 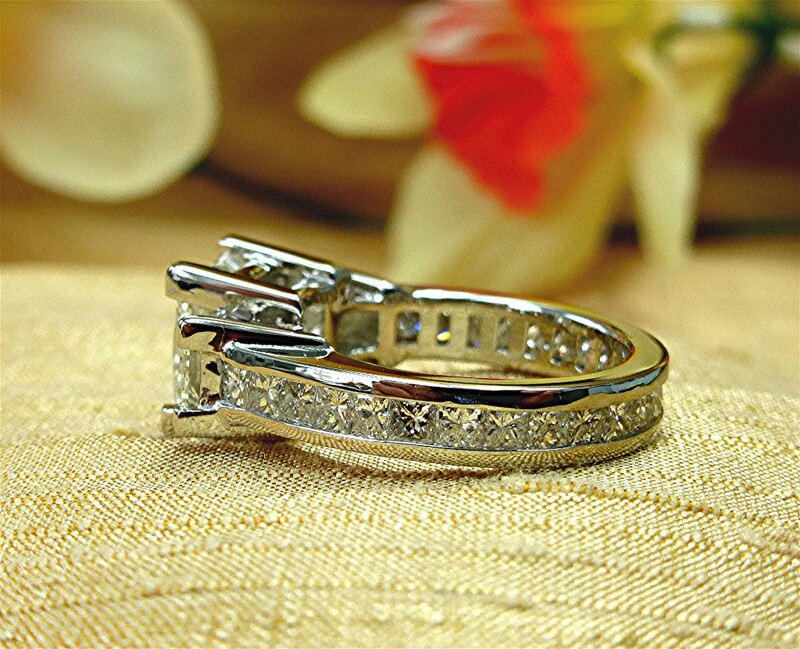 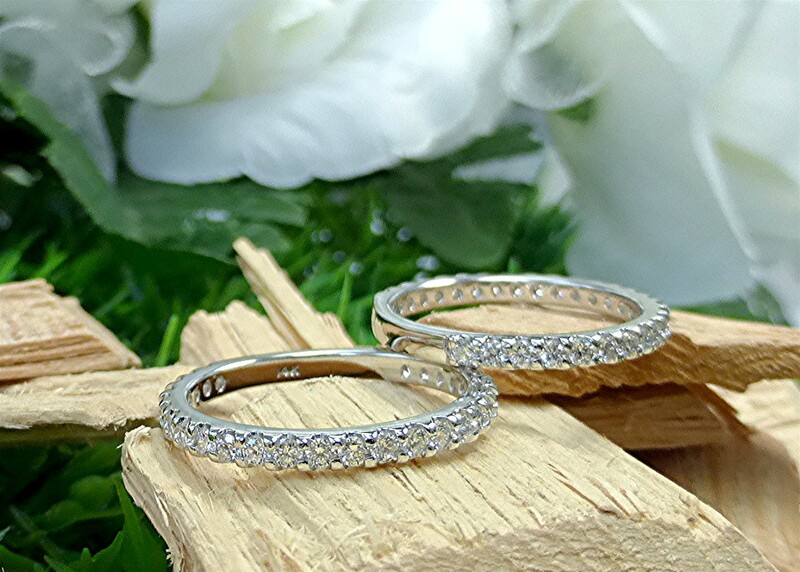 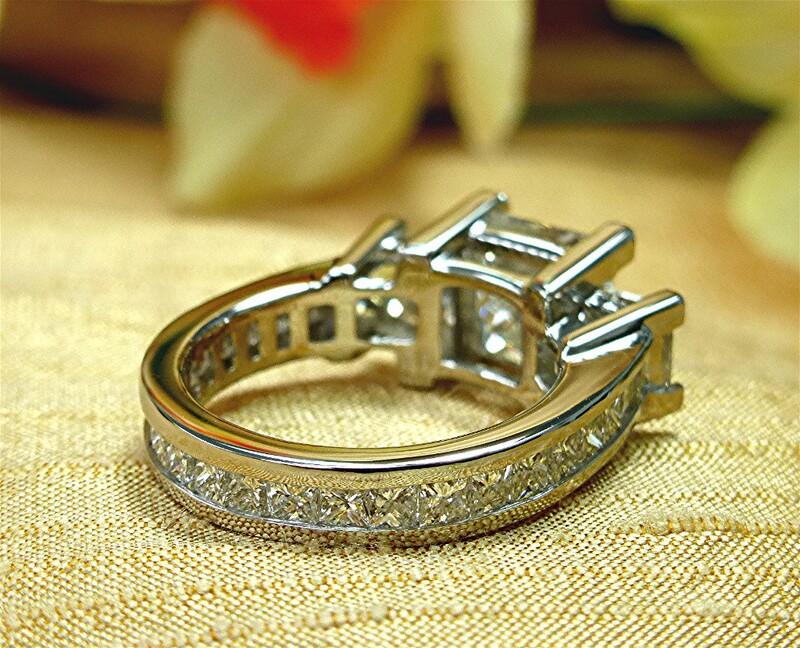 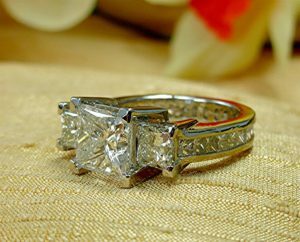 14k white gold diamond wedding band with 27 round brilliant cut diamonds total weight 0.60 ct., shared prongs U cut setting. 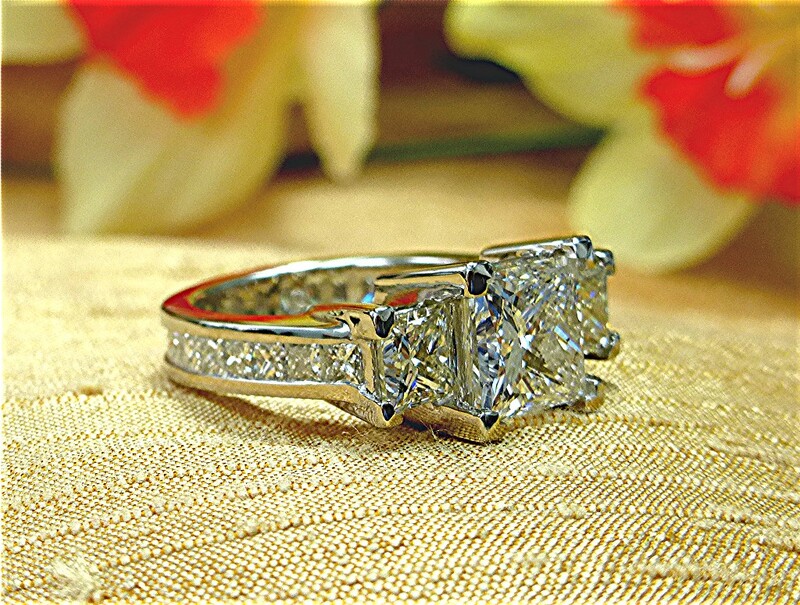 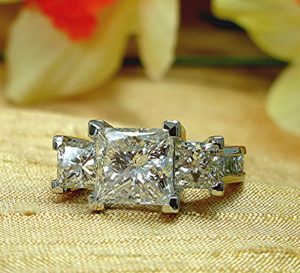 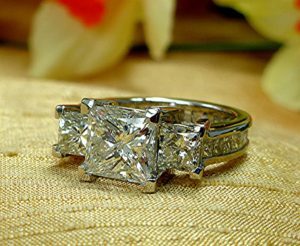 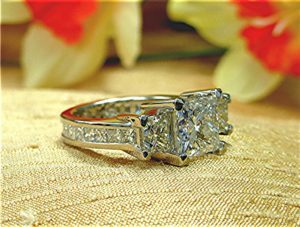 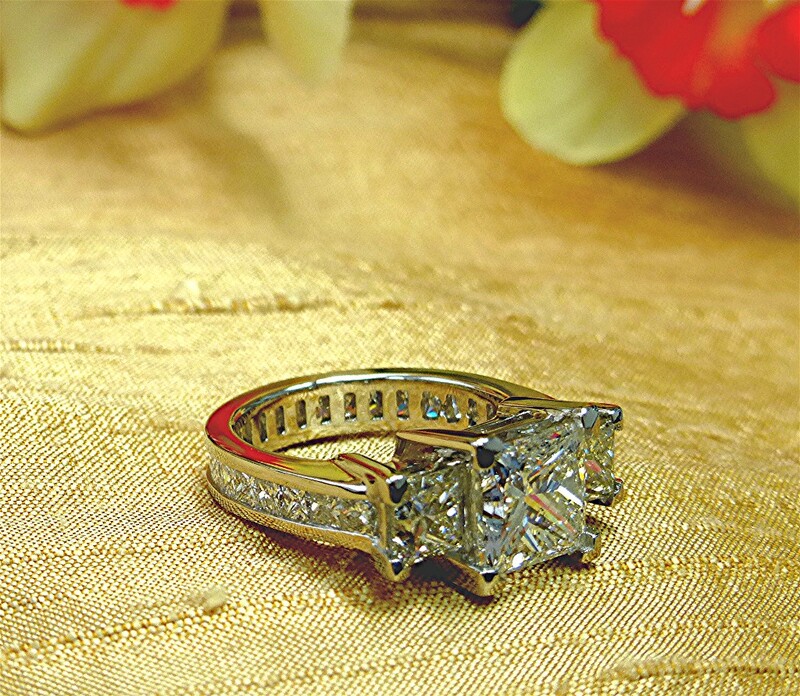 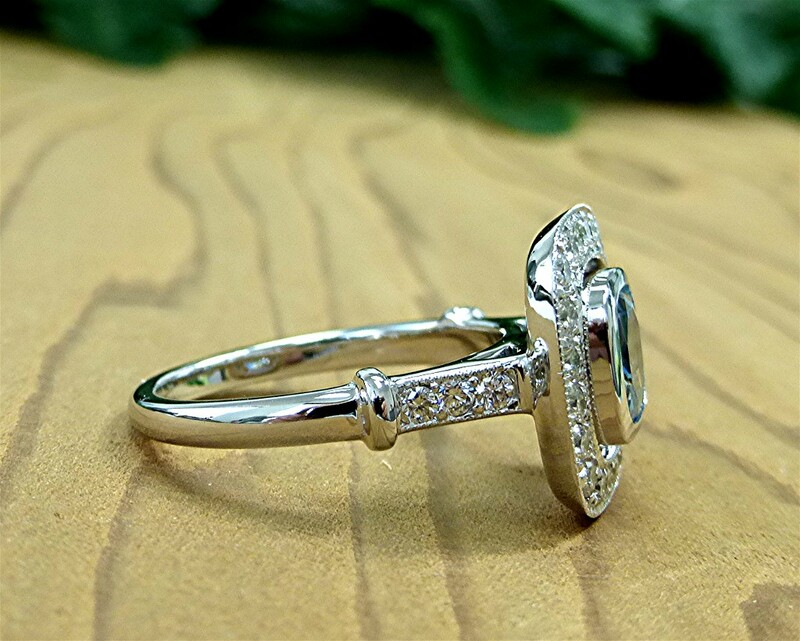 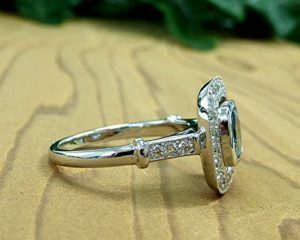 Center stone is a 2.84 carat with two 1.5 carat sides stones set in platinum mounting with 25 more smaller princess cut diamonds channel set all over the shank. 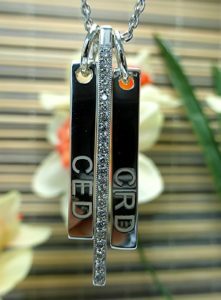 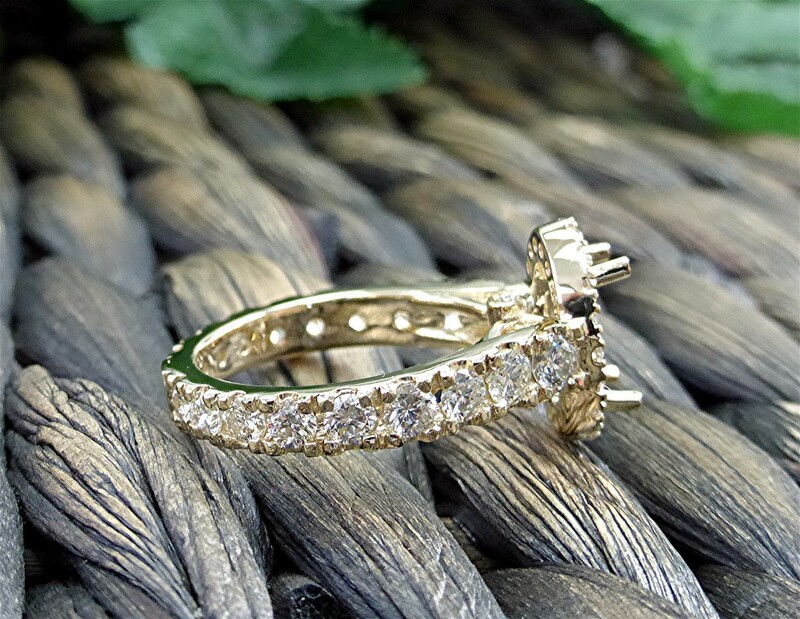 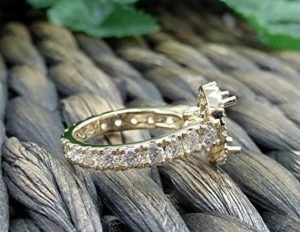 Center longer bar is pave set with 22 round diamonds weighing 0.18carat. two shorter bars are engraved with initials. 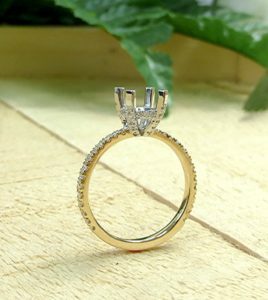 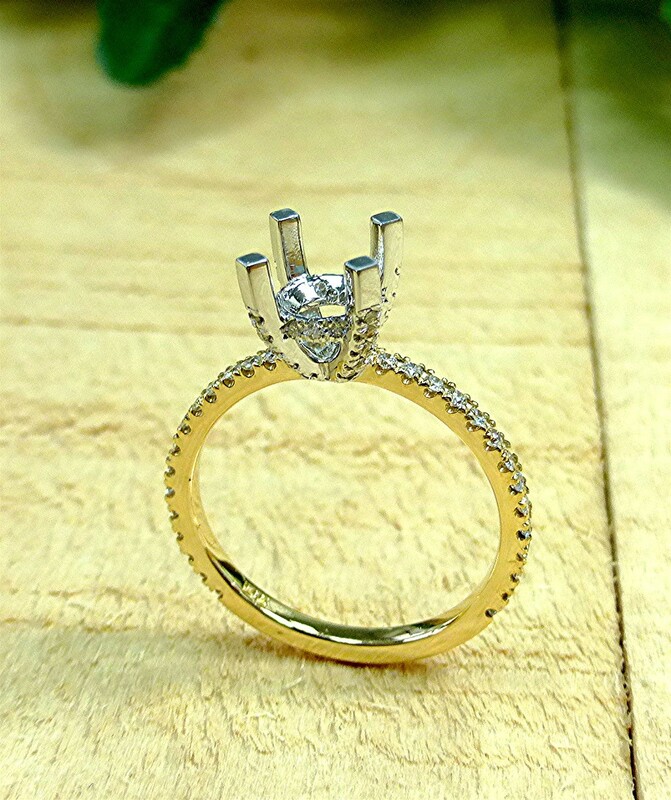 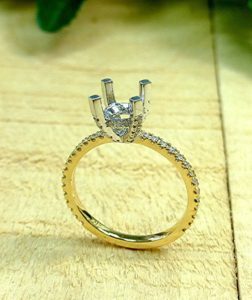 There are 20 round brilliant cut diamonds on halo and 6 on the shoulders of the shank for total of 0.67carart diamond weight. 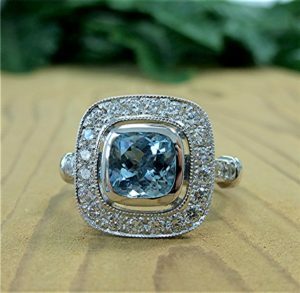 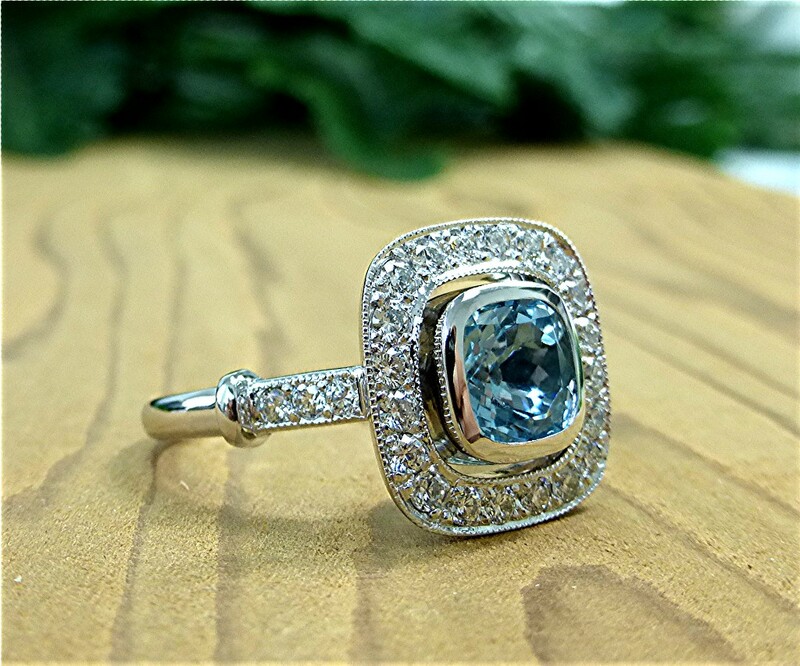 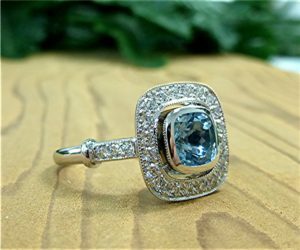 Center is a bezel set 7x7mm cushion cut aquamarine. Made of 14k white gold. 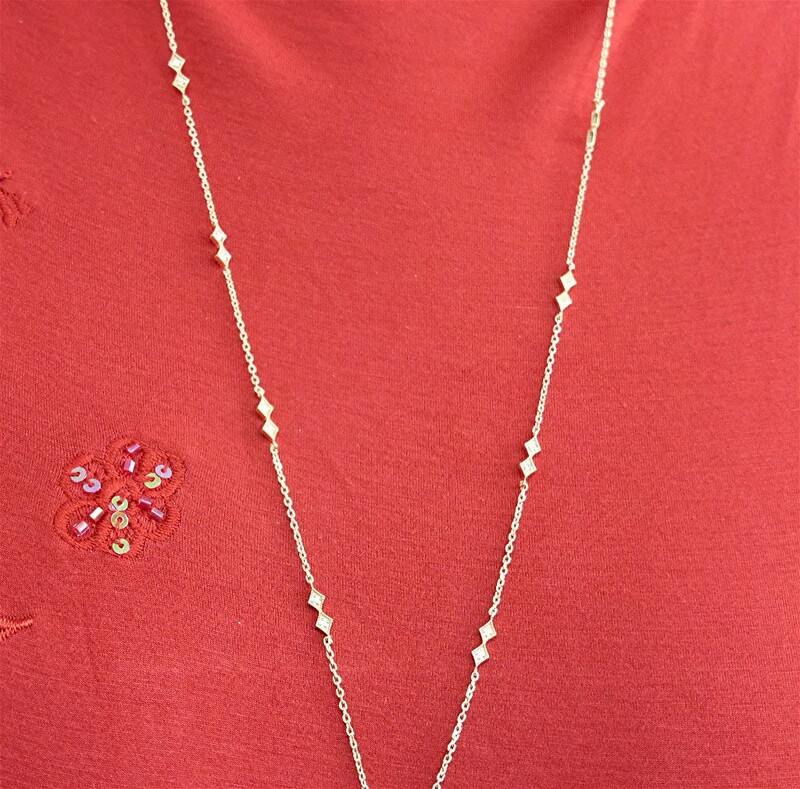 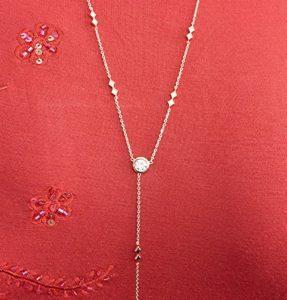 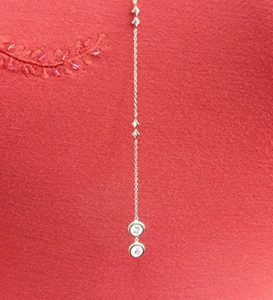 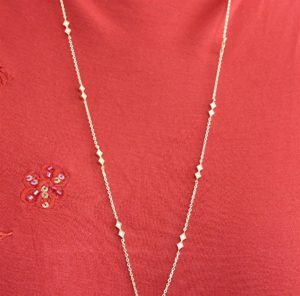 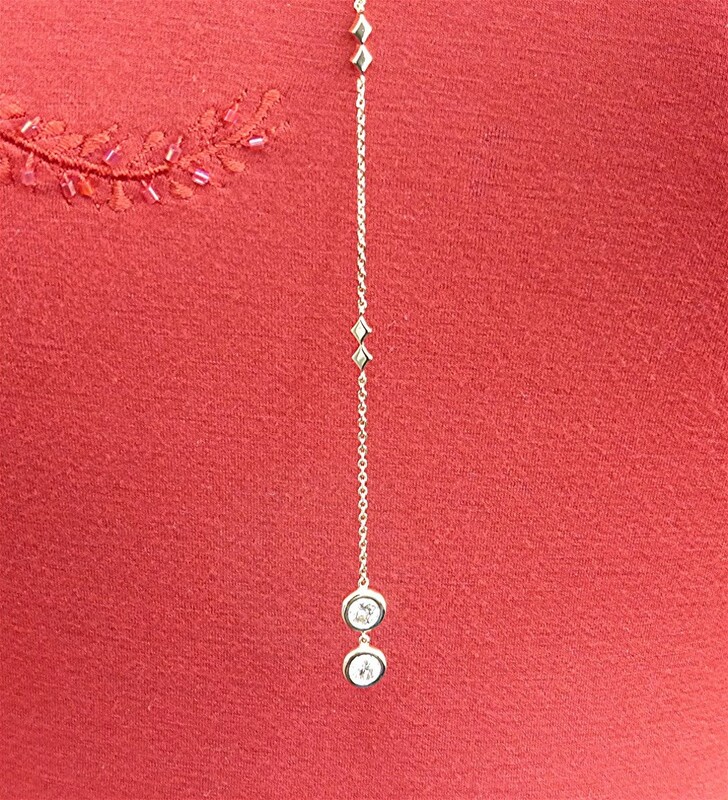 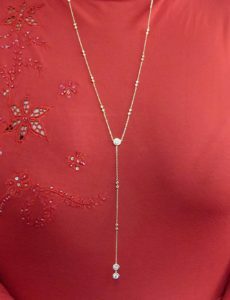 34 inches long necklace has 18 double diamond shaped gold ornament with 36 small bead set diamonds and three additional dangling larger bezel set diamonds at the bottom. 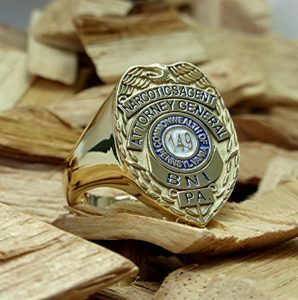 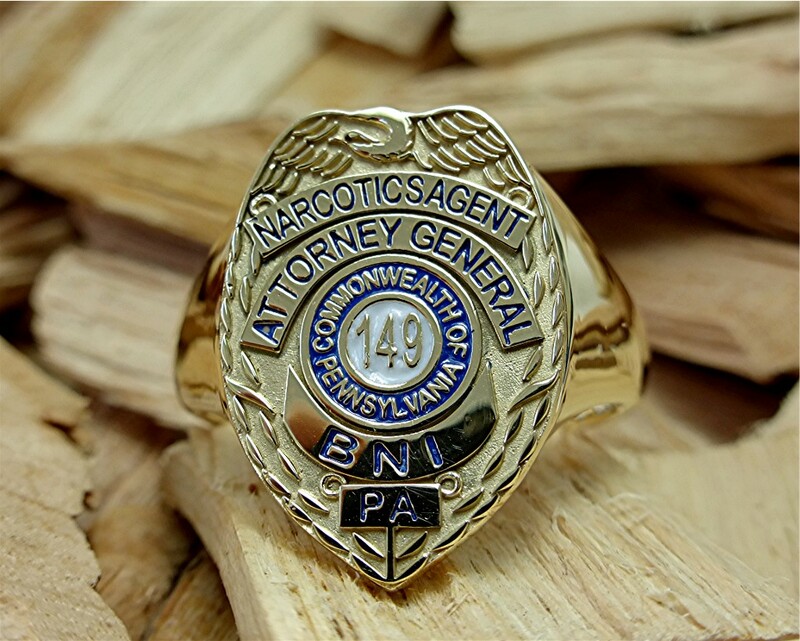 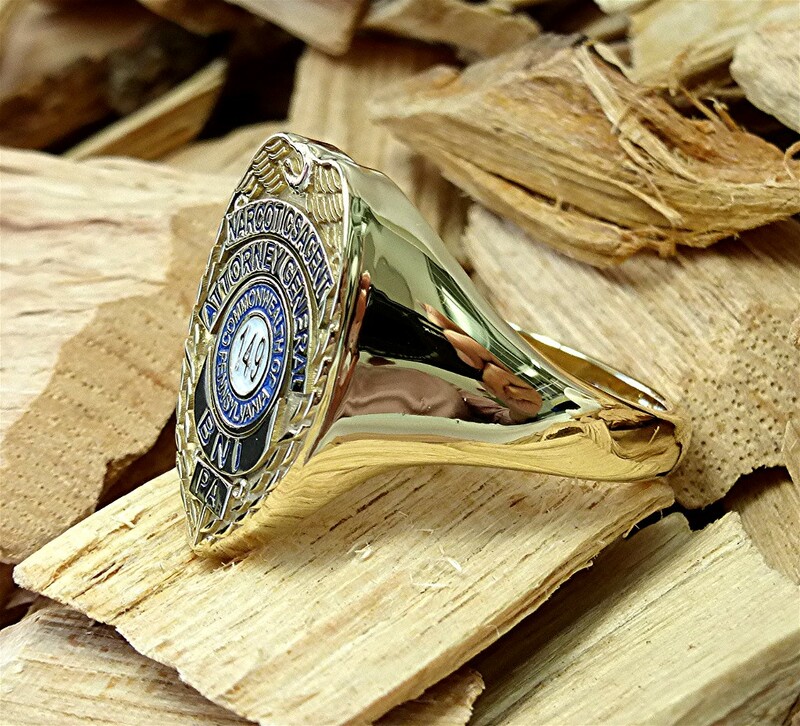 24mm wide ring with Narcotics Agent Logo with white and blue enamel and engraving inside of the shank.